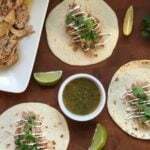 This Weight Watchers Carnitas Recipe is so easy and delicious! Crockpot Pork Carnitas are the perfect weeknight meal, and the leftovers are delicious served as burritos! I love making Crockpot pork carnitas. They’re so easy and tasty and it’s a bonus that the whole family loves them! I don’t have to worry about any complaints (and I get to rest easy knowing that they’re eating something healthy) so it’s a total win in my book! How many points in these Weight Watchers Crockpot pork carnitas? For Weight Watchers, this recipe is 3 Freestyle Smart Points per serving (assuming 8 servings). If you add sour cream, a reduced fat variety is 2 extra points per serving (2 Tbsp). Remember, I calculate all of my recipes on the Weight Watchers website using their recipe creator. It’s a great resource and if you’re not subscribed I’d highly recommend it! It makes tracking and calculating recipes a breeze. I prefer to use it to be sure that everything is correctly tracked. If you change any of the ingredients or amounts listed in this recipe it will change the Freestyle Smart Points calculations. Please be sure to recalculate for yourself if you change anything or have concerns about the points! 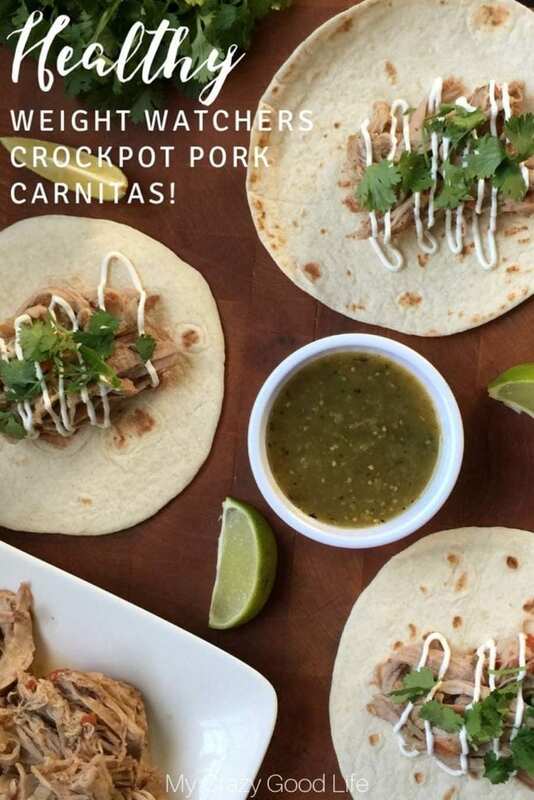 Why should I make these pork carnitas in the Crockpot? I love using the Crockpot to make these Weight Watchers pork carnitas because they’re easy, and the pork gets super tender when you slow cook it! There’s just something about that low heat and the slow cooking process that allows the meat to become super flavorful and juicy. Plus, you don’t have to monitor it all day long. You just drop it in and you are ready to go about your day. Looking for more great Weight Watchers Freestyle recipes to try? How do I make these Weight Watchers Crockpot Pork Carnitas? Slice one onion into thick slices and line the bottom of your crock pot with them. Dice the other onion and set aside for a topping. Place pork tenderloin on top of the onions and sprinkle your spices (and place bay leaves) on the pork. Pour 1/2 bottle of salsa, entire can of Rotel, and diced onions on and around pork. Cook on low for 5-8 hours, depending on the size of your tenderloin. Pull pork out and shred it, then add it back into the crockpot.Serve with the rest of the bottle of green chile salsa, warm flour or corn tortillas, diced onions, and sour cream. Is there a way to make Weight Watchers pork carnitas in the Instant Pot? Add pork tenderloin and other ingredients into the Instant Pot. Pressure cook on high pressure for 8 minutes (I did this for a 2 pound tenderloin), then let pressure naturally release for 15 minutes. Pull out the pork and shred it, then place it back to the Instant Pot. For Weight Watchers, this recipe is 3 Smart Points per serving (assuming 8 servings). If you add sour cream, a reduced fat variety is 2 extra points per serving (2 Tbsp). Each 6 inch corn tortilla is 2 Freestyle Smart Points. On the instant pot recipe the last instruction is “then place it back in the instant pot” ……Why? Do you turn it back on? What is the purpose of putting the meat back in the pot?